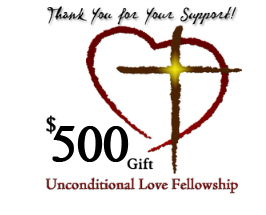 Malcolm, Nancy and the Unconditional Love Fellowship staff would like to thank you for your generous online donation. All donations are charged separately from merchandise. If you have purchased any products along with your donation you will see two separate charges on your credit statement. Your donation will be charged to 'Unconditional Love Fellowship' and any merchandise will be charged to 'Unconditional Love International'.